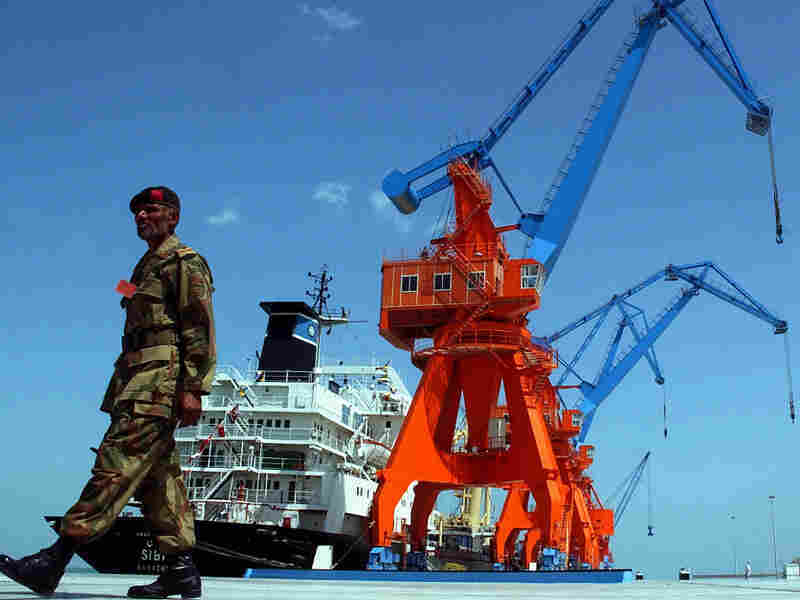 Indians Uneasy As China Builds Ports Nearby Some members of India's military establishment fear Chinese-funded ports being developed in surrounding countries could later turn into military bases. Skeptics, however, say it's ill-advised to base Indian policy on a Chinese strategy that may or may not exist. 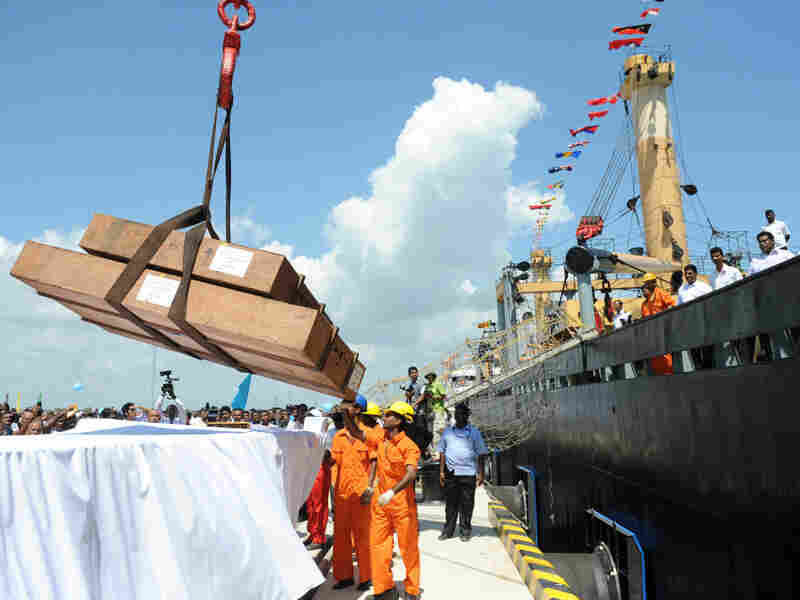 Workers unload cargo from the first vessel to enter the Chinese-funded port in Hambantota, Sri Lanka, in November 2010. China's Export-Import Bank provided 85 percent of the financing for construction of the port. As China flexes its economic and military muscle, it's bumping elbows with Asia's other big and fast-growing power: India. China's hunger for energy from the Middle East and resources from Africa brings it into the Indian Ocean. And some defense analysts in India are watching uneasily as China develops commercial ports in some of India's neighbor countries. To understand India's concerns about China, it helps to remember that the two countries have a history of border disputes, and that they fought a brief but ferocious war over territory in 1962. Long-time members of India's military establishment spend a lot of time thinking about China's new military, and its strategic aims. Arun Kumar Singh, a retired Indian vice admiral, habitually refers to China's military as "he." "He wants to keep us in a state of imbalance, because he wants us to be boxed up in South Asia, though we are the second-largest and possibly the largest, or the fastest-growing economy in the world today," Singh says. As a navy man, Singh is particularly concerned with China's efforts to build commercial ports in countries such as Myanmar, Bangladesh, Sri Lanka and Pakistan — the so-called "string of pearls" strategy. "What he is trying to do is trying to find innovative means of overcoming his geostrategic disadvantages. So one of them is 'string of pearls,' where he is building harbors and ports and airports," Singh says. The thinking goes that China is establishing these facilities for commercial purposes now, but that they might be turned into military bases at some point in the future. "The 'string of pearls' itself is a term — sounds very Chinese, doesn't it? — but it's a term that the Rand Corporation came up with originally, to describe what was meant to be a strategy of surrounding India with a whole bunch of bases," says Siddharth Varadarajan, who studies military policy as the New Delhi bureau chief for The Hindu newspaper. He says it doesn't make much sense to base India's policy toward China on speculation about a military strategy that may or may not exist. Jacob says policymakers also need to remember that China has its reasons for being wary of India's activities in China's neighborhood. A Pakistani soldier patrols the Gwadar port in southwestern Pakistan in 2007. Eighty percent of the port's initial funding was provided by China. "We have excellent relations with Mongolia and Vietnam, and the Chinese are not unaware of it," Jacob says. "So we want to focus on the string of pearls surrounding India, but you know we have another string, shall we say, garlanding the Chinese, which they are equally paranoid about." Varadarajan, the New Delhi bureau chief, says that a lot of China's current thinking on military policy is really defensive in nature, a way to protect legitimate and vital shipping lanes. "If India, as a major Indian Ocean power, could reassure the Chinese that India stands for freedom of the seas, and has a vital stake in working with other countries to protect sea lines, that could be one concrete way to build confidence and trust and also greater openness with the Chinese," Varadarajan says. Jacob has another reminder for foreign policy wonks who may be trying to figure out the strategies of both China and India: Both huge countries are going to be focused on their own internal problems long into the future, he says, and that will drive their foreign policy agendas.